Hey... We've all been there. 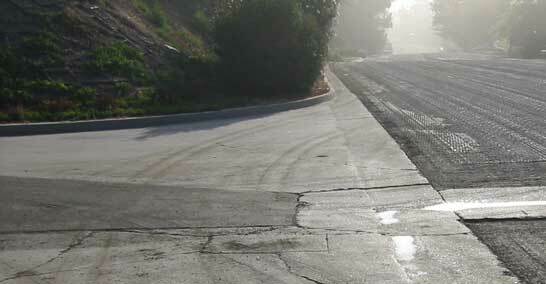 With Loma Alta being such a nice wide road, it is easy to swing wide and try to catch that flat spot just right. The thing is, we are all lucky that no-one has gotten very badly hurt. One of our neighbors recently escaped with his life at this intersection after he had to ditch his motorcycle and slid under a truck that was Dip Dodging. Thank God he slid under the truck behind the rear wheels and was able to walk away. Last year I attended an LA County Community meeting and met the Traffic Engineer, Pat Ashburn, who is responsible for roads in our area. At that time, I submitted drawings suggesting the addition of a "curb lane" to protect the many pedestrians, joggers, dog-walkers, cyclists and other motorists from "Dip Dodgers". Since this could be done simply with white stripes and perhaps some "Bots Dots" at intersections, it would be an extremely cost effective way to dramatically improve our safety and quality of life in this neighborhood. Last year he agreed. I have recently been in touch with Mr. Ashburn, as have one or two other neighbors. He still concurs that this is a good idea and that indeed this would be a perfect time to add white stripes to delineate "curb lanes" for the length of Loma Alta from Noyes School to the new Rubio Canyon Bridge. This 1 mile stretch of road is already a major pedestrian corridor. Please make your voice heard by calling Pat Ashburn and telling him your concerns about safety. Let him know what you think about adding two white stripes to the existing striping plan. The more people her hears from, the more likely it is that something will get done about it.